Please note that this article was written in 2001. It has not been updated since it refers to the relevant discussion points at that time. Porter had a lasting influence on strategic management with his books about competitive advantages on industry level and on global level, which were written in the eighties. Porter’s models like the Five Competitive Forces, the Value Chain or Porters Diamond have become standard equipment of the manager’s toolbox. Porter’s ideas became more and more subject of critique under the impression of the developing Internet economy during the last decade. Critics point out that economic conditions have changed fundamentally since that time. The rise of the Internet and of various e-business applications has strongly influenced nearly all industries. In fact, Porters theories base on the economic situation in the eighties. This period was characterized by strong competition, cyclical developments and relatively stable market structures. 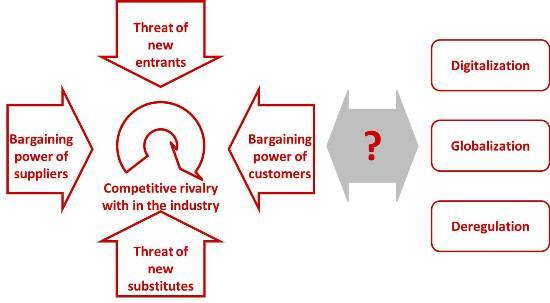 Porter’s models focus on the analysis of the actual situation (customers, suppliers, competitors etc) and on predictable developments (new entrants, substitutes etc). Competitive advantages develop from strengthening the own position within this Five-Forces-Framework. Hence, these models cannot explain or analyze today’s dynamic changes that have the power to transform whole industries. Larry Downes, co-author of “Unleashing the Killer App: Digital Strategies for Market Dominance” states in his article “Beyond Porter” that these assumptions are no longer viable. He identifies three new forces that require a new strategic framework and a set of very different analytic and business design tools: digitalization, globalization, and deregulation. Porters Five Forces vs. Downes’ Three Forces? As power of information technology grows, all players in a market will have access to far more information. Thus, totally new business models will emerge in which even players from outside the industry are able to vastly change the basis of competition in a market. Downes gives the example of the rise of electronic shopping malls, operated for instance by telecom operators or credit card organizations. Those who use the Five Forces Model and who base their thinking on today’s industry structure would never see these changes coming in time. Improvements in distribution logistics and communications have allowed nearly all businesses to buy, sell and cooperate on a global level. Customers, meanwhile, have the chance to shop around and compare prices globally. In the result, even locally orientated mid-sized companies find themselves in a global market, even if they do not export or import themselves. One can add here, that global and networked markets impose new requirements on organizations’ strategies. It is not enough any more to position oneself as a price-leader or quality-leader (like Porter suggests in his Generic Strategies model). Rather competitive advantages emerge now from the ability to develop lasting relationships to more mobile costumers and to manage far-reaching networks of partners for mutual advantage. The past decade has seen a dramatic shrinking of government influence in many industries like airline, communications, utilities and banking in the U.S. and in Europe. Fuelled by the new opportunities of information technology, organizations in these industries were able and forced to completely restructure their businesses and to look out for alternatives. Downes summarizes that the role of information technology is the foremost difference between strategy what he calls the ‚Porter world’ and in the new world of the new forces. The old economy used IT as a tool for implementing change. Today technology had become the most important driver for change. Critique – Is Porter Still Viable or is the “Critique of Porter” right? Downes’ arguments are convincing. In fact, digitalization, globalization and deregulation have become powerful forces during the last years, but Porter’s models rarely take them into consideration. Today’s markets are highly influenced by technological progress, especially in information technology. Therefore, it is not advisable – if not to say impossible – to develop a strategy solely on the basis of Porters models. Shapiro and Varian explain in their book „Information Rules: A Strategic Guide to the Network Economy“ that the economical laws that apply to products and services cannot be simply transferred to the new category information good. Production, marketing etc are different for products and services and, hence, are different for information too. However, if one wishes to conclude that Porters models are not useful any longer for strategy development, he should bear in mind that a good strategy should never base on just a few selected models. Even in the eighties, it was not advisable to build a strategy on nothing but Porters models. Every strategy should base on a careful analysis of all internal and external factors and on their potential future development. This is no new insight. Moreover, the latest shift from dot-com-hype to dot-com-crashes has given evidence that the basic laws of economics are viable for the new economy or information economy too. Exactly this – economic insights – are the basis for the sustainability for Porters ideas. Michael E. Porter is an economist. His Five Forces model is based on microeconomics. It just describes them in a more understandable way. Porter talks about the attractiveness of an industry that is influenced by the shape of five forces. In economics, the constellation of factors determines issues like profit maximization or supernormal profits. Nobody will question the viability of these laws. … this might be another explanation why there is so much critique of Porter. Therefore – despite all changes in industry dynamics and business models – Porters ideas are not totally obsolete. Their underlying idea is that every business operates in a framework of suppliers, buyers, competitors, new entrants and substitutes. This idea is valid in every competition-based economy. Even today, every organization in the old economy and in the new economy has to produce its goods and services and to sell them by offering an attractive bundle of value for money and supporting services. Every online portal has to produce or to buy content, to present it, and to find buyers for its offerings – be it visitors or advertisers. Hence, organizations still operate in the framework of the five forces described by Porter. What is new is that Downes forces made this framework more instable, dynamic and complex. Even careful market observation cannot foresee all potential new entrants or substitutes that might enter the market virtually overnight, driven by technological progress. Organizations have to adjust their structures, processes, business models and strategies to this new dynamics. Nevertheless, it is not less important to think about the own bargaining power towards suppliers or customers. The difference is that managers today have more means to influence competitive forces. Traditional thinking in Porters world was largely limited to achieving a better competitive position against other players. Now it is more important to form co-operations for mutual benefits. This can be ad hoc networks of partners, common standards, strategic alliances and much more in-between. In the result, Porters ideas have become just one tool from the manager’s toolbox. This tool is no longer the only or the most important tool. But it is not obsolete either. Rather it should be used in company with new and traditional management techniques in order to gain the most comprehensive picture. Downes critique of Porter implies that Porters models focus too much on the economic conditions of their era of origin. Therefore, their viability is limited under changed conditions. We need to add here that Downes new forces are derived from the economic conditions of their particular era too. Within some years or decades, they will have lost some of their importance because other developments have taken over the driving role. The most sustainable of Downes new forces will probably be digitalization. The good ‘information’ will become more and more important for any economy. There will be more technological progress in information technology that has the power to transform industries again and again. Every 18 months, processing power doubles while cost of processors holds constant. The utility of a network rises equivalently as the square of the number of its users rises. Globalization and deregulation, however, are typical drivers of our time. Within some years (and I intentionally avoid a precise prediction) governments will have deregulated everything that objectively makes sense. Later there is (almost) nothing left to deregulate. Hence, the transformation processes related to deregulation would be completed at some day in the future. Globalization is very similar. We can expect that all companies will adjust their operations to a global economy eventually. Those who do not will fail to succeed in the marketplace. If this is the case, global thinking becomes as much a standard management activity as cost control or selling are today. Than there will most probably no more major transformations from deregulation and globalization. In summary, Michael Porters models do not have the influence they used to have any more. New economic laws came up and other drivers stared to transform markets. Nevertheless, that does not mean that Porters theories became invalid. All we have to do is to apply them with the knowledge of their limitations in mind and to use them as a part of a larger framework of management tools, techniques and theories. This approach, however, is advisable for the application of every business model – brand-new or old, from Porter or from somebody else, and in every economy. Dagmar Recklies: Management Models – What they can Do and what they cannot Do. Dagmar Recklies: Porters Five Forces. Shapiro, C. & Varian, H.: Information Rules: A Strategic Guide to the Network Economy.